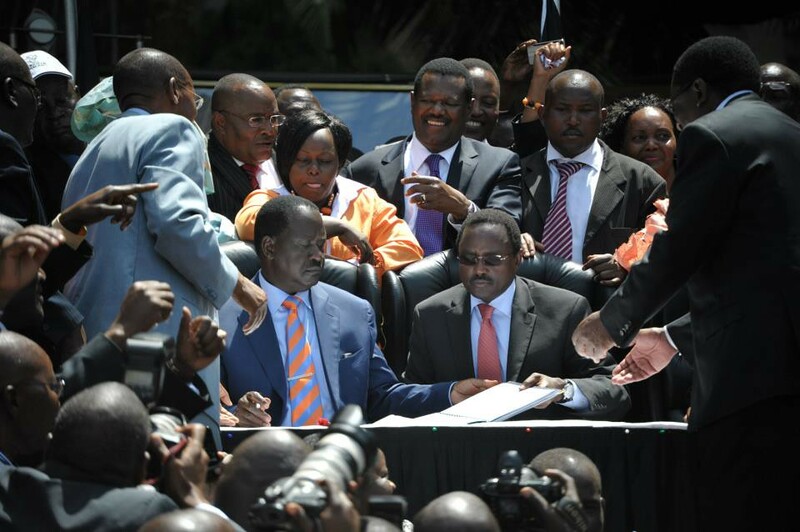 Prime Minister Raila Odinga and Vice-President Kalonzo Musyoka have sealed a pre-election coalition deal. 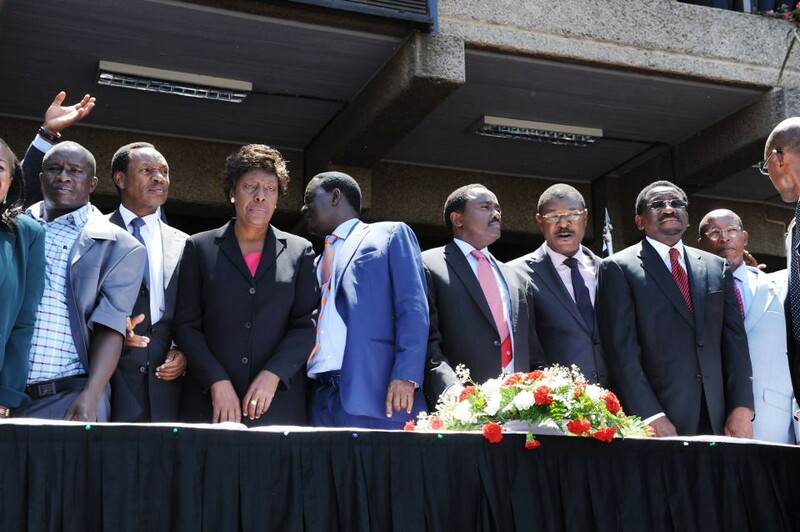 The pact involving the Orange Democratic Movement (ODM), Wiper Democratic Movement (Wiper) and Ford Kenya led by Trade minister Moses Wetangula was signed at the Kenyatta International Conference Centre, Nairobi Tuesday. The Coalition for Reform and Democracy (CORD) also brings on board Narc led by Charity Ngilu, who is Mr Musyoka's rival, UDM among other parties. The signing ceremony was a culmination of lengthy negotiations just a day ahead of the deadline for lodging of coalition agreements with the Registrar of Political Parties seems to set the stage for a bruising two-horse race between the Odinga-Musyoka pairing and the Uhuru-Ruto come the election next March. The VP, who has in the past week publicly rejected any attempts by his allies to team up with Mr Odinga, eventually gave in on Sunday night, following talks with the ODM leader. He met the PM, who had flown back from the Tononoka rally in Mombasa, at the Jomo Kenyatta International Airport's VIP Lounge, where they discussed a coalition document their respective negotiators put together. Vice President Kalonzo musyoka has a word with Prime Minister Raila Odinga at a past function. Vice President Kalonzo Musyoka has said his Wiper Democratic Movement party (WDM) will on Tuesday sign a pre-election pact with Prime Minister Raila Odinga's Orange Democratic Movement (ODM) and New Ford-K ahead of the forthcoming General Election. Mr. Musyoka said the agreement will involve a team of leaders who are serious in the fight against tribalism and negative ethnicity. He said the Wiper party technocrats were working with their ODM and New Ford-Kenya counterparts to finalize on the agreement before it is signed on Tuesday. "After we sign the agreement tomorrow, Kenyans will then know who true reformers are in this country,'' said Mr Musyoka on Monday. 1. Will he accept an open nomination process for the number two slot ama he has the feeling of entitlement. 2. How do we appreciate his recent and not so recent comments about not working with ODM - 'Trust factor'. 3. His 'lack of spine' lives a lot to be desired in all matters political. 4. He trotted globally fighting a losing battle against the ICC...has his stand/opinion changed? 5. Would I be wrong to label Mr Katikati an opportunist who saw his political light fading and decided to lurch at ODM coattails? That said, I believe it would be wrong for ODM to give this guy any favored status and as a matter of fact aunge folenikama kila mtu na asubiri mjujo. His clout is not that big in Ukambani amidst all the other rebels kuanzia kina Charity Ngilu na Harun Mwau...and the usual comic Kalembe Ndile of TIP. Anyway this is politics and lemmie go back to reading "The 48 Laws of Power" for therein lies something. Vice President Kalonzo Musyoka and Special Programmes minister Esther Murugi join an entertainment troupe at during celebrations to mark the World Aids Day at Afraha Stadium, Nakuru December 1, 2012. Mr Musyoka said he was not ready to be anyone's running mate in the next General Election. Vice President Kalonzo Musyoka has said he is not ready to be anyone's running mate in the next General Election. Mr Musyoka dismissed reports that the Wiper Democratic Movement (WDM) party had agreed a pre-election deal with the Orange Democratic Movement (ODM). "For anybody to suggest that I, Stephen Kalonzo Musyoka, can be somebody's deputy is misleading the Kenyan population," he said during celebrations to mark the World Aids Day at Afraha Stadium in Nakuru Saturday. "I am not saying that it can't happen. I am just saying that it has not happened," said Mr Musyoka. The VP said Wiper's national executive council has not met to discuss pre-election issues as reported in the media. "What I read in sections of the media are not accurate because our party's national executive council has not met to discuss on such a document and I wonder which part of the world we are in when we read such statements." Mr Musyoka, however, said that his party was ready to engage in talks with other political parties. "But this does not mean that we cannot talk to each other as Kenyans," he said. He told the meeting attended by Cabinet minister Esther Murugi, assistant minister Lee Kinyanjui and PS Andrew Mondoh among others that the December 4 deadline to deposit coalition agreements with the Registrar of Political Parties has created anxiety among Kenyans. He said life will move on after that date and even after the March 4, 2013 General Election. Mr Musyoka said he will name his running mate on January 4 next year, which will be the deadline according to the law. He distanced himself from coalitions based on tribal arithmetic. "We should not auction our communities. Coalitions should not be about how many votes you can bring to the table. I am ready to talk to any Kenyan leader who wants to form a coalition of ideas." The Vice President said smaller parties can merge to form a strong coalition that can accommodate all communities for the sake of peace and stability. He said Kenyans should elect leaders irrespective of tribal and political affiliations. On the HIV and Aids scourge, Mr Musyoka praised the move by the Ministry of Special Programmes and National Aids Control Council to establish an HIV Equity Tribunal in Kenya. "This tribunal represents a bold step towards achieving the goal of eliminating stigma and discrimination against people living with HIV by promoting laws and policies that advanced human rights and fundamental freedoms,'' he said. He called on members of the public to make use of the tribunal to ensure that their rights are not violated because of their HIV positive status. Will Kalonzo entry swing the vote for Raila in race for State House? in other words what do they call this if not an alliance. uchaguzi mkuu wa Kenya ni kipimo kingine cha ukuaji wa demokrasia nchini humo na Afrika Mashariki kwa ujumla. siasa za Kenya ni tofauti na siasa za mataifa mengine ya Afrika Mashariki. Baada ya William Rutto na Uhuru Kenyata kufunga ndoa yao ya kisiasa hivi majuzi, leo mafahali mengine mawaili ya siasa za Kenya Raila Odinga na Kalonzo Musioka wamejitokeza hadharani katika ndoa ya kisiasa ikiwa ni siku ya mwisho leo kwa wote wanaofanya miunagano kama hiyo. Sasa ni dhairi mvutano wa kisiasa itakua kati ya Odinga, Musioka Vs Wiliam, Kenyata. We wish them all the best,wakumbuke kuna kushinda na kushindwa pia na wawe tayari kukubali matokeo!!!!!!!!!!!!!!!! teh teh teh...I like the investment politicians do in Kenya. Siasa za Kenya zimefikia patamu! Kwa mwendo huu Odinga anachukua Ikulu ya Harambee 2013! Kalonzo Musyoka ni aina ya mwanasiasa mwenye kupima wapi ushindi unaponukia.. Amechungulia na kuona kambi ya ushindi ni ya Raila.. Nina uhakika come March.. Raila atakuwa raisi wa nne wa Jamhuri ya Kenya..
Kila la heri "Railonzo"!Tunataka amani tu Kenya. Mungu ibariki Kenya Mungu mbariki Raila Odinga. That sounds a great combination! best of lucky to the guys and to the Kenyans as well.